Watching your favourite sport, be it tennis, cricket or football, is not only entertaining but also a way of unwinding. Combined with a glass of beer and a few friends and the entire experience is greatly elevated. Sports bars aim at combining these two experiences for sports lovers. 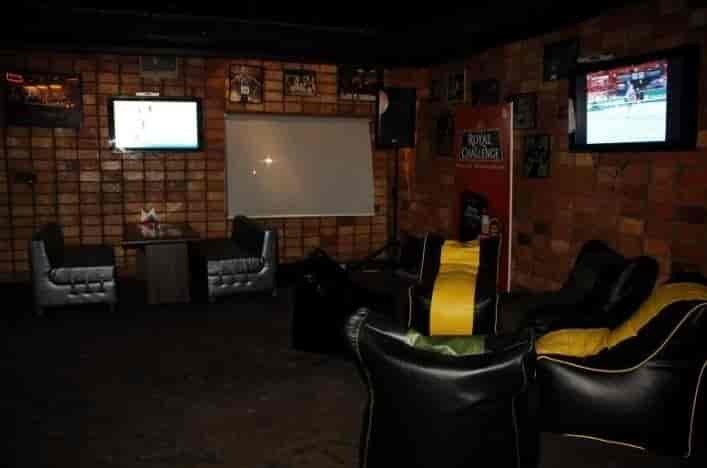 Here is our list of the top sports bars in Hyderabad. Tollgate is a themed cafe and bar in Hyderabad. The theme of the cafe is based on roadways and it has interiors like a petrol pump, a flashing signal, and chairs that are carved out of car models. The menu offering is that just of a highway dhaba. They also have some innovative offerings on the bar menu. The place is also a favourite of those who enjoy watching sports and grabbing a drink to go with it. Named after the famous street in London, 10 Downing street will remind you of the city of London itself. The decor and the ambience remind you of a typical English pub. 10 Downing Street has been held in high regard since it began operations. The place is known for its Lasagne and Long Island Iced tea. The bar showcases most of the sports events going on with special emphasis given on IPL. Xtreme Sports Bar is the best sports bar in Hyderabad. You can feel the sports fever pulsating in the bar. The interiors are lined with sporty wall hangings and different football club posters. Beer lovers will absolutely love this place and should check out the Bucket of 6 option. The bar serves a multi-cuisine offering with the Japanese cuisine being a big hit amongst visiting patrons. Shamrock The Irish bar has one of the best ambiances amongst the bars in Hyderaambiencesbar shows the various sporting even present throughout the country with IPL being it’s most favorite. The place is also known for the killer stuffed mushrooms it serves. There is also a dancing area in the bar for you to shake a leg when your favorite team wins. The Masti Sports Bar is a casual dining bar located in the Gachibowli area of Hyderabad. The bar is a typical sports bar with screens that display matches of football and cricket. The bar is right next to SVM bowling lane and patrons are often found catching a game of bowling during their visit here. SKYHY is a rooftop bar famous amongst the local corporates. The bar is also famous for its karaoke nights. SKYHY has a massive projector on its rooftop section where various matches are screened. The bar also hosts gigs of various underground artists. SKYHY serves some of the best cocktails that you can grab while watching your favourite team play. Mustang Terrace Lounge is one of the oldest lounges in Hyderabad. It is known for the music and its open rooftop floor. The lounge below the rooftop has a massive LED TV where cricket and football matches are screened. Due to its location, it is a local favorite amongst the people working in the nearby IT parks. It’s Mutton biryani and Malai Broccoli are famous for visiting patrons. Rush Sports Bar has some unbelievably comfortable bean bags that you can sink into. You can watch your favorite games lying in the embrace of these bean bags. The place has a huge projector on which they display most of the games going on. The place has a buffet option available as well as an a la carte menu. The Kung pao chicken and Roast chicken are a local favorite. Address: Floor 3, Ratnadeep Supermarket, Hitech City, Hyderabad. The Repete Brewery & kitchen is another microbrewery in Hyderabad known for its variety of beers. The place is a laidback venue with some quaint ambiance setting. The walls are covered with covered with souvenirs from the jazz era. The bar also screens cricket and football matches on LED screens that they have. The lager paired up with the Roulade is a must try at Repete. Hoppipola is a famous chain of bars known throughout India. The place is known for its fusion food and funky music. The ambiance of the place is quite trendy. You can also play board games that are provided to you by the courteous staff. There is a massive projector at the Hyderabad outlet that showcases various sporting events, especially cricket. Zero 40 Brewing is one of Hyderabad’s foremost microbreweries. The place offers over six types of home brewed beer and also plans to add more to the list. What people may not know about this place that offers itself as a co-working space for people looking to work out from one. The interiors are spacious and uncluttered. The brewery also screens various sporting events. The brewery also has a pool table to try your hand out at the sport. Prost Brew Pub is one of the most well-known microbreweries in Hyderabad.The brewery is known to serve its own beers with the Apple cider beer being the most loved by the patrons. Going to a sports bar with your friends or your loved ones can be a relaxing as well an entertaining experience. You can talk the night away wt and eat till your heart’s content with your friends and loved ones . So the next time you are in Hyderabad do check out our top picks for Sports bars and let us know of your experiences in the comments section below.